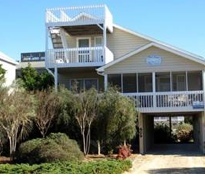 We of all people certainly understand why you might prefer one of our Sunset Beach NC house rentals over renting a condo or staying at a hotel. Any one of the Sunset Beach NC house rentals that we have at Sloane Realty will provide you with far more space and privacy than you’d find in other accommodations. It’s only in house rentals that you’re likely to have your own fenced in property to use for whatever purpose you want — grilling out, relaxing in a lounge chair with a good book, or laying by the swimming pool. If you’re looking for pet-friendly accommodations you’re more likely to find them among the house rentals that we have. These homes are provided to you fully furnished and decorated for a comfortable stay. Enjoy the nautical theme that some homes provide. Amenities such as laundry appliances and well-equipped kitchens in the home provide you with unmistakable convenience. Enjoy your own screened in porch, patio or sundeck as well as plenty of parking for you and your guests. Upcoming events in the area are always worth checking out. The 3rd Annual Cape Fear Beer Fest will be held on March 2 at the Convention Center in downtown Wilmington, NC. This event features unlimited tasting of more than 100 top-quality beers made by the finest brew masters. Hours: 2-6 p.m. (VIP admission at 1 p.m.). Admission for this event is $30.00 to $40.00. For more info call (910) 251-5101.